At our house, we love Babytime! by Episencial products! 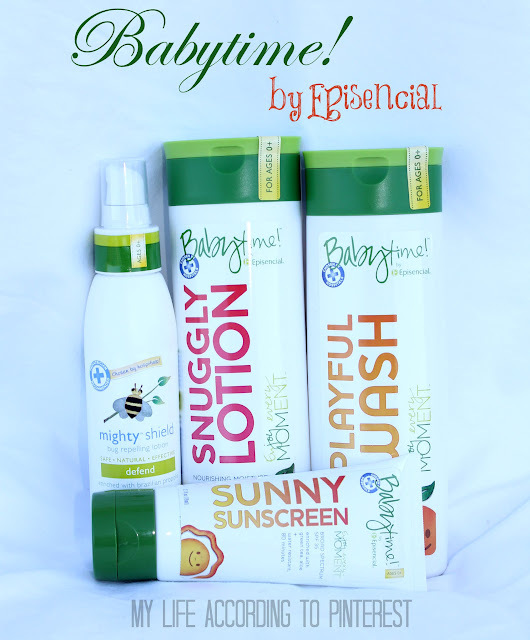 They have great products to help you get your child ready for summer and keep their delicate skin totally protected. Babytime! by Episencial simplifies choosing effective, natural, safe skincare for your baby so you can focus on the little memories that are made during the most unexpected times. When changing a diaper, giving a bath, massaging baby to sleep or getting ready to spend some time outdoors, Babytime! by Episencial is there to help you Enjoy Every Moment! daily environmental challenges from water, sun and air. The first thing we tried was the Playful Wash. This wash is a shampoo and wash in one which I love. I has a really nice citrus smell since one of its ingredients is tangerine oil. It's a light gel and Baby Boy smelled great after his bath with this wash. It's gentle enough for sensitive skin and pH-balanced to be eye-safe and quick-rinsing. After a bath we used the Snuggly Lotion. This lotion is cherry scented. It smells good, but it was a little bit too fruity scented for my taste. I think kids would love the scent though. What I love about this lotion is that it's nice and thick, so it is nourishing and hydrating for Baby Boy's skin. Even though it's a thick lotion it applies lightly and is totally non-greasy. Now that summer is truly here sunscreen is a MUST everyday for us here in Florida! Even on a short walk I make sure I use sunscreen on Baby Boy. The Sunny Sunscreen is great. It's a broad spectrum, moisturizing sunscreen with SPF 35. It's water resistant for up to 80 minutes, but when I'm really out and about I apply it at least every 60 minutes just to be sure Baby Boy is thoroughly protected from the sun. The only thing I would change about this sunscreen is that I wish it was a higher SPF- like a 50. I know the general guidelines are that as long as it's above 30 SPF it's good, but for my little guy I like to use a little more. Those summer days and nights can get pretty buggy and the Mighty Shield is perfect for Baby Boy. I LOVE that it's all natural and designed to work with the skin's own natural defense system to keep skin bug-free. It's even formulated with natural anti-bacterial and anti-inflammatory properties to soothe irritated skin or previous bug bites. You can layer it with the Sunny Sunscreen for great outdoor protection. We used this over Memorial Day when we spent the day at a friend's lake house and Baby Boy only got one bug bite! So, I'd say it works! Follow & Connect: You can Like Episencial on Facebook. You can follow them on Twitter and Pinterest. Buy It: You can purchase Babytime! by Episencial products on their website. Win It: Come back tomorrow to enter to win the same Sun Care Pack in the Keeping Cool in the Sun Giveaway Hop! I love that the lotion is cherry-scented! I also like that it is non-greasy! I love that they have different scents from traditional baby washes. I would love to try the orange, would be a nice change from regular lavender or baby powder scents! it is so important to use natural ingredients on our skin and on baby!! Thank you!! I wonder if their sunscreen has been formulated differently than the original Episencial. However, I love their other stuff! I have considered trying this brand, but I like to know what things smell like first. It sounds like these have some good scents, as opposed to some of the other natural products that smell too herby. I like the the lotion is non-greasy. I hate putting heavy lotions on my son because then he rolls all over the couch with it on! I really like that the sunscreen is mineral based! I like safe products to use on my grandsons, and these sound like great products with nice scents... the Mighty Shield sounds great for my daughter who is a mosquito magnet. Thanks for the review. Its good to know the shampoo/wash is safe for sensitive skin, that's an issue in our house. Love how you used a statistic, ingredients, and photos!!! Made the review a great showcase for what seems like a great product! Will definatly be checking out this site for skincare needs for my 3 year olds excema! Thank you! The sunscreen looks great! I want something that is safe for my son who is only 3 months old. I've heard that anything above 45 SPF is just overkill and it doesn't mean it's actually more effective? I noticed you say that you usually try to give as much SPF as possible . . . I just wanted to let you know. It's super lame of me to say that without any factual backing, and I honestly can't remember where I've read it, but maybe that can spark a new blog post! :) The sunscreen looks to be really great, and it's highly recommended too. Thank you for the review, I would love to try these products! My step daughter is going to have a baby in less than 2 weeks. I would love to have this for her as a gift. I love their lotion and wash! I really want to try their sunscreen! Thanks for the review! I like that their sunscreen is water resistant. And the citrusy scents sound yummy. Thanks for reviewing this product. love that the lotion is thick, but not greasy. and I agree that the kids would probably love the cherry scent!